Dubai ( doo-BY; Arabic: ? Dubayy, ) is the most populous town and emirate in the United Arab Emirates (UAE), and the second largest emirate by territorial size after the capital, Abu Dhabi. Dubai is located on the southeast coast of the Persian Gulf and is one of the seven emirates that make up the country. Abu Dhabi and Dubai are the only two emirates to have veto power over critical matters of national importance in the countrys legislature. The city of Dubai is located on the emirates northern coastline and heads up the Dubai-Sharjah-Ajman metropolitan area. Dubai is to host World Expo 2020. Islam is the official religion of Dubai and the UAE. The currency of Dubai is the Dirham. Dubai’s Burj Khalifa is the world’s tallest building. Real estate and construction, trade and financial services are the largest contributors to Dubai’s economy. 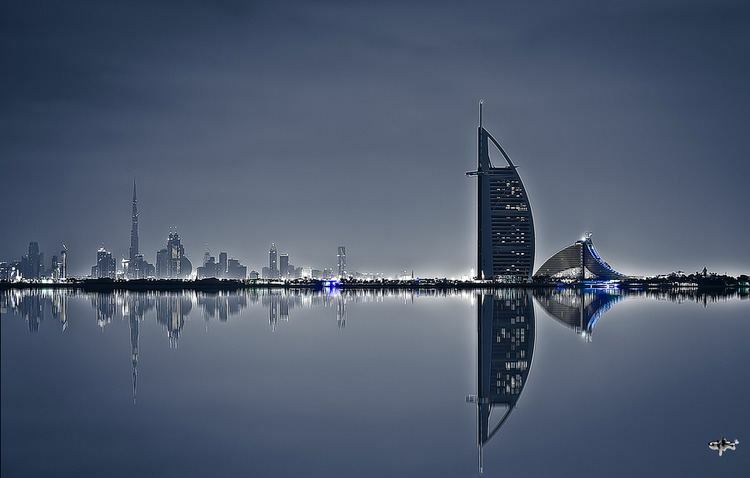 Dubai has emerged as a global city and business hub of the Persian Gulf region. It is also a major transport hub for passengers and cargo. By the 1960s Dubais economy was based on revenues from trade and, to a smaller extent, oil exploration concessions, but oil was not discovered until 1966. Oil revenue first started to flow in 1969. Dubais oil revenue helped accelerate the early development of the city, but its reserves are limited and production levels are low: today, less than 5% of the emirates revenue comes from oil. The emirates Western-style model of business drives its economy with the main revenues now coming from tourism, aviation, real estate, and financial services. Dubai has recently attracted world attention through many innovative large construction projects and sports events. The city has become symbolic for its skyscrapers and high-rise buildings, in particular the worlds tallest building, the Burj Khalifa. Dubai has been criticised for human rights violations concerning the citys largely South Asian workforce. Dubais property market experienced a major deterioration in 2008–2009 following the financial crisis of 2007–2008, but is making a gradual recovery with help from neighbouring emirates. As of 2012, Dubai is the 22nd most expensive city in the world and the most expensive city in the Middle East. In 2014, Dubais hotel rooms were rated as the second most expensive in the world, after Geneva. Dubai was rated as one of the best places to live in the Middle East by American global consulting firm Mercer. Although stone tools have been found at many archaeological sites, little is known about the UAEs early inhabitants as only a few settlements have been found. Many ancient towns in the area were trading centers between the Eastern and Western worlds. The remnants of an ancient mangrove swamp, dated at 7000 BC, were discovered during the construction of sewer lines near Dubai Internet City. The area was covered with sand about 5,000 years ago as the coast retreated inland, becoming part of the citys present coastline. Pre-Islamic ceramics have been found from the 3rd and 4th centuries. Prior to the introduction of Islam to the area, the people in this region worshiped Bajir (or Bajar). After the spread of Islam in the region, the Umayyad Caliph of the eastern Islamic world invaded south-east Arabia and drove out the Sassanians. Excavations by the Dubai Museum in the region of Al-Jumayra (Jumeirah) found several artifacts from the Umayyad period. The earliest recorded mention of Dubai is in 1095 in the Book of Geography by the Andalusian-Arab geographer Abu Abdullah al-Bakri. 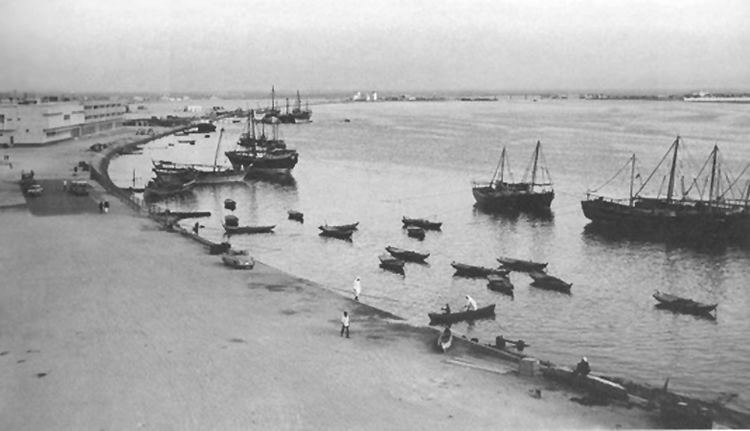 The Venetian pearl merchant Gaspero Balbi visited the area in 1580 and mentioned Dubai (Dibei) for its pearling industry. Dubai is thought to have been established as a fishing village in the early 18th century and was, by 1822, a town of some 7-800 members of the Baniyas tribe and subject to the rule of Sheikh Tahnoon of Abu Dhabi. In 1833, following tribal feuding, members of the Al Bu Falasa tribe seceded from Abu Dhabi and established themselves in Dubai. The exodus from Abu Dhabi was led by Ubaid bin Saeed and Maktum bin Butti who became joint leaders of Dubai until Ubaid died in 1836, leaving Maktum to establish the Maktoum dynasty. Dubai signed the treaty of Perpetual Maritime Truce of 1853 along with other Trucial States and also - like its neighbours on the Trucial Coast - entered into an exclusivity agreement in which the United Kingdom took responsibility for the emirates security in 1892. Two catastrophes struck the town during the 1800s. First, in 1841, a smallpox epidemic broke out in the Bur Dubai locality, forcing residents to relocate east to Deira. Then, in 1894, fire swept through Deira, burning down most homes. However, the towns geographical location continued to attract traders and merchants from around the region. The emir of Dubai was keen to attract foreign traders and lowered trade tax brackets, which lured traders away from Sharjah and Bandar Lengeh, the regions main trade hubs at the time. Persian merchants naturally looked across to the Arab shore of the Persian Gulf finally making their homes in Dubai. 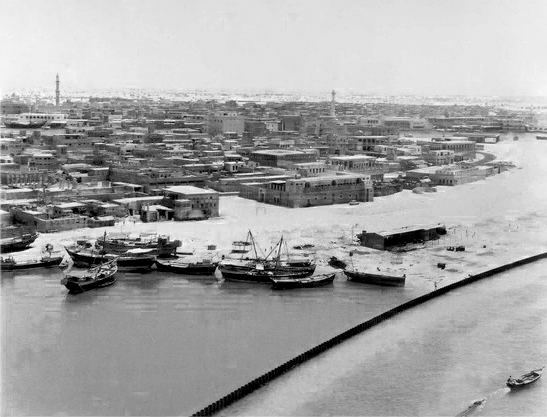 They continued to trade with Lingah, however, as do many of the dhows in Dubai Creek today, and they named their district Bastakiya, after the Bastak region in southern Persia. Dubai is situated on the Persian Gulf coast of the United Arab Emirates and is roughly at sea level (16 m or 52 ft above). The emirate of Dubai shares borders with Abu Dhabi in the south, Sharjah in the northeast, and the Sultanate of Oman in the southeast. Hatta, a minor exclave of the emirate, is surrounded on three sides by Oman and by the emirates of Ajman (in the west) and Ras Al Khaimah (in the north). The Persian Gulf borders the western coast of the emirate. Dubai is positioned at 25.2697°N 55.3095°E? / 25.2697; 55.3095 and covers an area of 1,588 sq mi (4,110 km2), which represents a significant expansion beyond its initial 1,500 sq mi (3,900 km2) designation due to land reclamation from the sea. Dubai lies directly within the Arabian Desert. However, the topography of Dubai is significantly different from that of the southern portion of the UAE in that much of Dubais landscape is highlighted by sandy desert patterns, while gravel deserts dominate much of the southern region of the country. The sand consists mostly of crushed shell and coral and is fine, clean and white. East of the city, the salt-crusted coastal plains, known as sabkha, give way to a north-south running line of dunes. Farther east, the dunes grow larger and are tinged red with iron oxide. The flat sandy desert gives way to the Western Hajar Mountains, which run alongside Dubais border with Oman at Hatta. The Western Hajar chain has an arid, jagged and shattered landscape, whose mountains rise to about 1,300 metres (4,265 feet) in some places. Dubai has no natural river bodies or oases; however, Dubai does have a natural inlet, Dubai Creek, which has been dredged to make it deep enough for large vessels to pass through. Dubai also has multiple gorges and waterholes, which dot the base of the Western Al Hajar mountains. A vast sea of sand dunes covers much of southern Dubai and eventually leads into the desert known as The Empty Quarter. Seismically, Dubai is in a very stable zone—the nearest seismic fault line, the Zagros Fault, is 200 kilometres (124 miles) from the UAE and is unlikely to have any seismic impact on Dubai. Experts also predict that the possibility of a tsunami in the region is minimal because the Persian Gulf waters are not deep enough to trigger a tsunami. The sandy desert surrounding the city supports wild grasses and occasional date palms. Desert hyacinths grow in the sabkha plains east of the city, while acacia and ghaf trees grow in the flat plains within the proximity of the Western Al Hajar mountains. Several indigenous trees such as the date palm and neem as well as imported trees such as the eucalypts grow in Dubais natural parks. The houbara bustard, striped hyena, caracal, desert fox, falcon and Arabian oryx are common in Dubais desert. Dubai is on the migration path between Europe, Asia and Africa, and more than 320 migratory bird species pass through the emirate in spring and autumn. The waters of Dubai are home to more than 300 species of fish, including the hammour. The typical marine life off the Dubai coast includes tropical fish, jellyfish, coral, dugong, dolphins, whales and sharks. Various types of turtles can also be found in the area including the Hawksbill turtle and Green Turtle, which are listed as endangered species. Dubai Creek runs northeast-southwest through the city. The eastern section of the city forms the locality of Deira and is flanked by the emirate of Sharjah in the east and the town of Al Aweer in the south. The Dubai International Airport is located south of Deira, while the Palm Deira is located north of Deira in the Persian Gulf. Much of Dubais real-estate boom is concentrated to the west of Dubai Creek, on the Jumeirah coastal belt. Port Rashid, Jebel Ali, Burj Al Arab, the Palm Jumeirah and theme-based free-zone clusters such as Business Bay are all located in this section. One of the worlds fastest growing economies, Dubais gross domestic product is projected at USD 107.1 billion, with a growth rate of 6.1% in 2014. Although a number of core elements of Dubais trading infrastructure were built on the back of the oil industry, revenues from oil and natural gas currently account for less than 5% of the emirates revenues. It is estimated that Dubai produces 50,000 to 70,000 barrels (7,900 to 11,100 m3) of oil a day and substantial quantities of gas from offshore fields. The emirates share in the UAEs total gas revenues is about 2%. Dubais oil reserves have diminished significantly and are expected to be exhausted in 20 years. Real estate and construction (22.6%), trade (16%), entrepôt (15%) and financial services (11%) are the largest contributors to Dubais economy. The UAE culture mainly revolves around the religion of Islam and traditional Arab culture. The influence of Islamic and Arab culture on its architecture, music, attire, cuisine and lifestyle are very prominent as well. Five times every day, Muslims are called to prayer from the minarets of mosques which are scattered around the country. Since 2006, the weekend has been Friday-Saturday, as a compromise between Fridays holiness to Muslims and the Western weekend of Saturday-Sunday. The citys cultural imprint as a small, ethnically homogenous pearling community was changed with the arrival of other ethnic groups and nationals—first by the Iranians in the early 1900s, and later by Indians and Pakistanis in the 1960s. In 2005, 84% of the population of metropolitan Dubai was foreign-born, about half of them from India. Due to the touristic approach of many Dubaites in the entrepreneurial sector and the high standard of living, Dubais culture has gradually evolved towards one of luxury, opulance and lavishness with a high regard for leisure-related extravagance. Annual entertainment events such as the Dubai Shopping Festival (DSF) and Dubai Summer Surprises (DSS) attract over 4 million visitors from across the region and generate revenues in excess of $2.7 billion. The International Festivals and Events Association (IFEA), the worlds leading events trade association, has crowned Dubai as IFEA World Festival and Event City, 2012 in the cities category with a population of more than one million. Large shopping malls in the city, such as Deira City Centre, Mirdiff City Centre, BurJuman, Mall of the Emirates, Dubai Mall and Ibn Battuta Mall as well as traditional souks attract shoppers from the region. 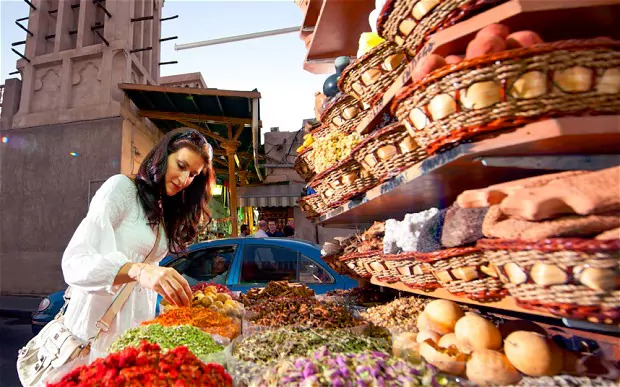 Arabic food is very popular and is available everywhere in the city, from the small shawarma diners in Deira and Al Karama to the restaurants in Dubais hotels. Fast food, South Asian, and Chinese cuisines are also very popular and are widely available. The sale and consumption of pork, though legal, is regulated and is sold only to non-Muslims, in designated areas of supermarkets and airports. Similarly, the sale of alcoholic beverages is regulated. A liquor permit is required to purchase alcohol; however, alcohol is available in bars and restaurants within hotels. Shisha and qahwa boutiques are also popular in Dubai. Dubai is known for its nightlife. Clubs and bars are found mostly in hotels due to the liquor laws. The New York Times described Dubai as "the kind of city where you might run into Michael Jordan at the Buddha Bar or stumble across Naomi Campbell celebrating her birthday with a multiday bash". Biryani is also a popular cuisine across Dubai with being the most popular among Indians and Pakistanis present in Dubai. The inaugural Dubai Food Festival was held between 21 February to 15 March 2014. According to Vision (Magazine) the event was aimed at enhancing and celebrating Dubai’s position as the gastronomic capital of the region. The festival was designed to showcase the variety of flavours and cuisines on offer in Dubai featuring the cuisines of over 200 nationalities at the festival. The next food festival will be between 27 October 2015 to 29 October 2015. Dubai Shopping Festival is a yearly event in Dubai, It started in 1995, and its running till now, this event attracts a lot of visitors from worldwide to visit Dubai and get advantage of the sales during this festival. In 2015 it started from January 1, till February 1, but The Department of Tourism and Commerce Marketing in Dubai announced the cessation of all entertainment and musical activities related to the Dubai Shopping Festival for 3 days, starting from Friday, January 23 to Sunday, January 25 due to the death of King Abdullah bin Abdulaziz former ruler of Saudi Arabia. Dubai Shopping Festival 2016 will begin on 1 January 2016 till 1 February 2016.